Born and raised in Cleveland Ohio, Michael S. Vassel joined the US Army after high school and served as an Indirect Fire Infantryman at Fort Hood in Texas. During his time in the Army, he received both his Airborne and Air Assault badges. After completing active duty, he joined the Ohio National Guard for an additional 3 years while attending college. While in college, Michael wrote a short story titled "Hide and Seek", which received the honor of being published by the college's quarterly literary magazine. Since 1989 he has worked as a mechanical engineer in the materials handling industry, designing conveyor systems for warehouses throughout the United States. In addition to "Fine Again", Michael has written several dark fantasy novels. In his spare time, he enjoys reading, traveling, and attending as many concerts as possible. All of us will reach a point in our lives where we lose someone we love. Whether it is the love of our life or a loved one like a grandmother or mom or dad. While this story deals with a man's journey of grieving the love of his life, the story resounds and could be applied to any of these losses. It can be impossibly hard to work through grief and come back out the other side feeling that we still have a fulfilled life. I really felt connected to Mike and there were so many times where I wanted to hug him and tell him that some day it would get easier, he could do it. This story will resound with anyone who has ever experienced devastating loss in their life and must find a way to deal with it, must find the hope through the darkness that seems as if it will never end. If you need a story that is deep and uplifting as well, this book is for you. It could be seen as a heavy read because of the emotional story that author Michael Vassel tells, but it is a truly fantastic story of love, loss, and learning to live and love again. Fine Again is a contemporary romance novel written by Michael S. Vassel. Mike’s first interaction with Amy had been when she handled his phone call to his friend, Bill, scheduling one of their regularly held lunches. Her voice had been a welcome change from that of Bill’s former receptionist, a sixty-plus-year-old woman named Mary Jane. When he arrived at Bill’s place of business to pick him up, he was stunned by the gorgeous woman seated behind the reception desk, and her calm and casual familiarity made him feel awkward and shy. Amy had come into his life at the best of possible times, that is, if there’s any good time for a married man with children to meet a new woman. But things had not been at all good at home, and his marriage was basically in a holding pattern until the kids went off to college. Bill knew instinctively that Amy and Mike were meant for each other. 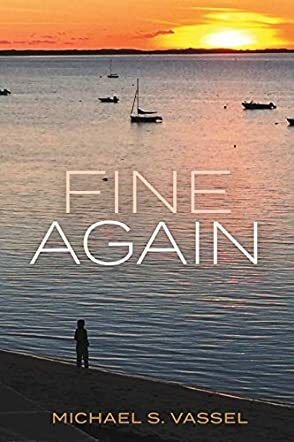 In his contemporary romance novel, Fine Again, Michael S. Vassel’s main character pens a succession of journal entries remembering the love he had recently lost. Having Mike speak of his childhood and early years gives this novel the feeling that one is reading a memoir as Mike shares both the good times and the bad. Fine Again explores the stresses and strains that come with having relationships, including when one partner has close friendships outside of the relationship, leaving the other feeling neglected and left out, and the hard work and commitment that is sometimes necessary to get past this type of situation. Vassel’s characters are well defined and credible, and his story flows smoothly. Fine Again is a thought provoking and well written look at marriage and relationships; it’s highly recommended. Author Michael S. Vassel’s style of writing is extremely relatable when it comes to his moving novel, Fine Again. There are thought provoking gems as well such as: “Work the problem; don’t let the problem work you.” The novel includes present day diary entries, sections of his lost love, and farther back to where his life all began. All this back and forth and in between is done to perfection. It is an unnerving feeling to know something terrible is about to happen, but you aren’t sure exactly what that “terrible” thing is and when it will be revealed. The dialogue feels authentic for the most part and the characters are downright 3-D. Although there isn't much in the way of backdrop, it isn't missed in any way. Fine Again is a touching story about one man’s lost love. Author Michael S. Vassel weaves such a realistic tale that I started to believe this was a memoir instead of fiction. The storytelling is expert in its unraveling of the narrative; piece by piece you eat it up like a long-awaited dessert. It will make you cry in many sections. Whether you are a female or a male reading this, you will be able to relate not only to the loss of love but to the growing pains that enter our lives as we experience what we do and don’t want in someone, such as cheating, lying and thievery on the negative side. Coming from my own female perspective, it is a breath of fresh air to read what is going on in a man’s mind as the character goes through his life from youth to middle age and the ups and downs. This is a great book you won’t be able to put down.